Vicki Nelson participated in her initial high school varsity tennis match as a freshman at Wooster High School. She proceeded to win (and win and win and win and win). She won 136 consecutive singles matches from 1978 to 1981 before tasting defeat for the first time in her final high school match in the semi-finals of the OHSAA Class AAA State Tournament. During the streak, she captured three straight Class AAA State Championships. She attained a national junior ranking of number eleven in 1980, a year in which she won the Sugar Bowl title, was a finalist in the Easter Bowl, and reached the semi-finals of the Orange Bowl and the Seventeen Magazine Tournaments of Champions. Vicki’s amateur success did not end with that final high school loss. She then attended Rollins College in Florida and gained All-American recognition in both 1981 and 1982. She compiled a 26-1 mark as a freshman, meeting defeat in the NCAA quarter-finals. Her record as a sophomore was 43-3 with losses coming in the NCAA Finals, the AIAW Finals and an AIAW team match. She was honored as College Player of the Year by Tennis magazine. Following her second year at Rollins, Vicki turned pro and has been a member of the professional circuit since that time. She has played in all the Grand Slam Tournaments including the U.S. Open, the French Open, the Australian Open and Wimbledon. She has competed with practically every name professional over her career and has defeated several top ten players at various times. Her best finish was the winning of the Brazilian Open in 1986. 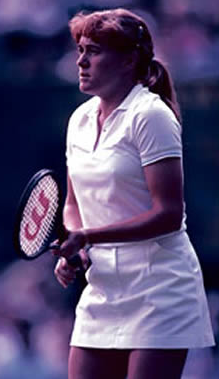 She was also a finalist in the 1985 Italian Open and reached the Final Sixteen in the 1982 U.S. Open. Vicki made the Guinness Book of record with a marathon six hour, thirty-one minute match in a tournament in 1984. The tie-breaker lasted one hour and forty-seven minutes. It included the record-breaking 643 volley point which lasted twenty-nine minutes. Nelson-Dunbar has maintained a world ranking in the sixties and seventies over most of her career. She has been married to Keith Dunbar since 1985 and currently resides in Ridgeville.